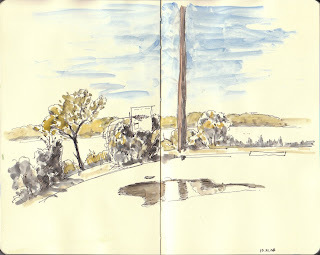 A couple of sketches from Remley Point. 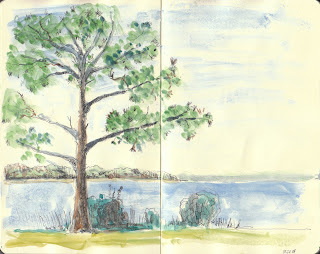 Trying out different things - the top is mostly watercolor with waterproof ink in a Rapidograph pen (which I'm finding out is kind of tricky on the Molskine paper), and the lower one is water soluable ink in a fountain pen with touches of color. Thanks for the nice comments on my blog. I really like your style, I think I should loosen up a bit. If you put the "follow me" widget/thingee at the top right of your blog I could follow you too.